A good friend got married last week. 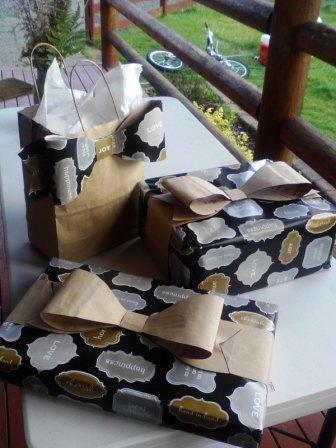 We had a couple of things to contribute to the new household… but when I started wrapping things, I realized that I didn’t have enough wrapping paper to go around. One set of things came in a plain paper bag, and I wanted to visually tie all three things together. I think I may be the only person on the planet that would think it kosher to wrap up wedding gifts in recycled Trader Joe’s bags. I found a post on how to make these here. I’m so thankful that other, more craft-y people than me, take the time to post these things. If I’d have had to go into town to get more wrapping paper, it would have been a 45-minute round trip! This entry was posted in Projects and tagged gift wrapping, paper bows, paper grocery bags, Trader Joe's bags, wedding gifts. Bookmark the permalink.